The Qvarfot Felling Axe is one out of eight models in the new Hultafors Premium Axe series. The Premium line will replace the Classic line. 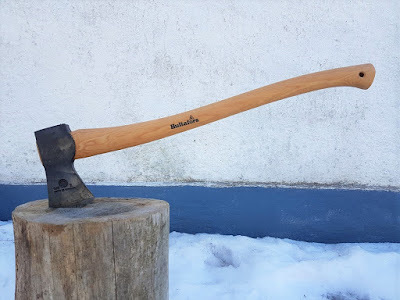 The hand forged Qvarfot consist of a Swedish made slim 26" axe handle from American hickory and a 0,85 kg heavy axe head made of Swedish steel. This full size axe is one of my favorites when it comes to robust tasks around the camp. The axe is slim yet heavy duty. Stay tuned for more info about the Qvarfot Felling Axe on this page.